While my baby’s health is my top priority, I’ll admit to not always feeling like I have the time and energy to put together homemade, nutritious meals for him. Pre-packaged snacks like cookies, crackers, and teething biscuits, are the easiest grab-and-go option sometimes. Although many companies have jumped on the “all natural” and “organic” bandwagon, it’s important for parents to be aware of the ingredients that these products contain. 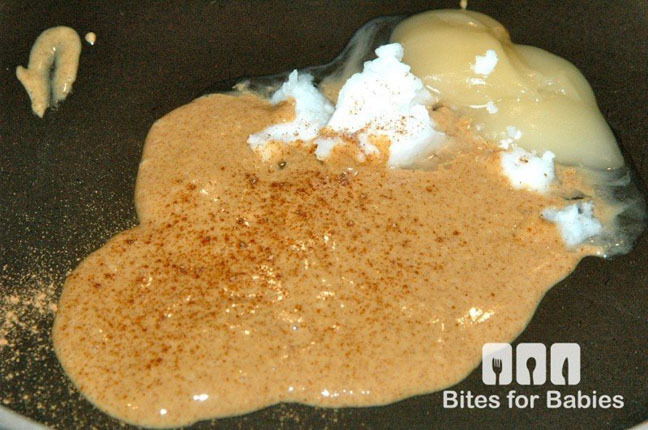 One of the only ways to know what actually goes into your baby’s food is by making it yourself. In the last few years, lots of “organic” and “natural” packaged finger foods have turned up on the market. 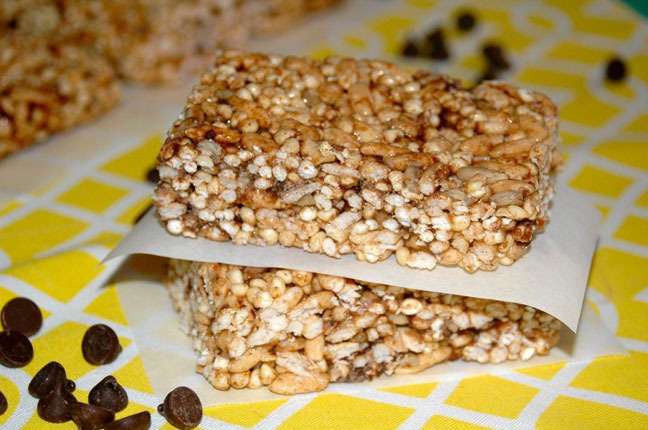 Although they offer variety for baby, they often contain a ton of hidden unhealthy ingredients or preparation methods and may not be as healthy as they’re marketed to be. They are typically highly processed. Ingredients in their original form are most often the most wholesome. Virtually every product contains sugar. Baby finger foods are much more expensive than regular foods. Simple foods that can be made or prepared at home can cost more than double when purchased pre-packaged. Many contain high levels of sodium. Making your own finger foods means you can control the amount of sodium that goes in them. One baby-friendly first food is cereal. Cereal is wonderful because baby can easily grab it and self-feed. My kids love cereal (doesn’t every baby?! ), but I hesitate buying anything that isn’t 100% organic since I’m skeptical about the ingredients that are found in commercial cereals. 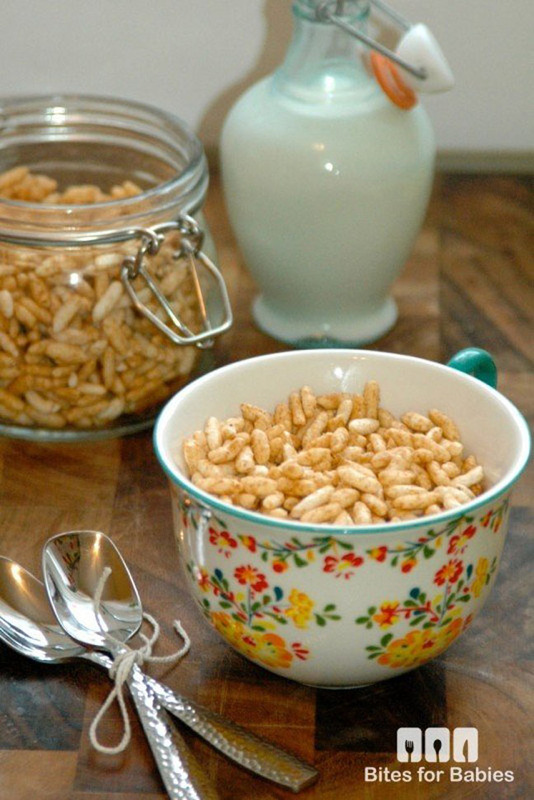 One day it dawned on me that instead of spending a ton of money on unnecessarily expensive organic cereal I could make my own healthy cereal for baby…with puffed rice! 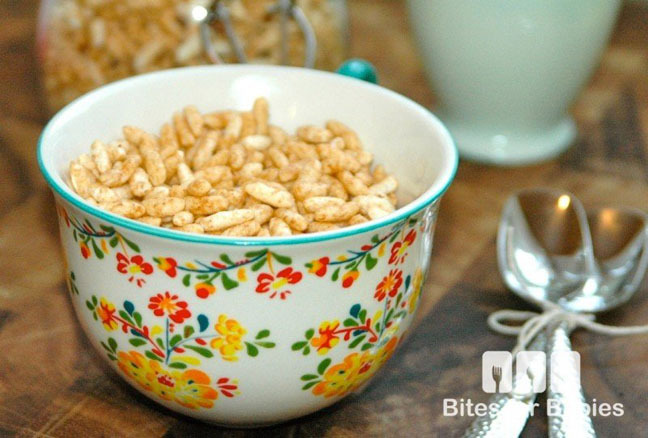 My kids are now two-and-a-half and four years old, and they still love this homemade puffed rice cereal recipe that I’ve been making for them since they were babies. 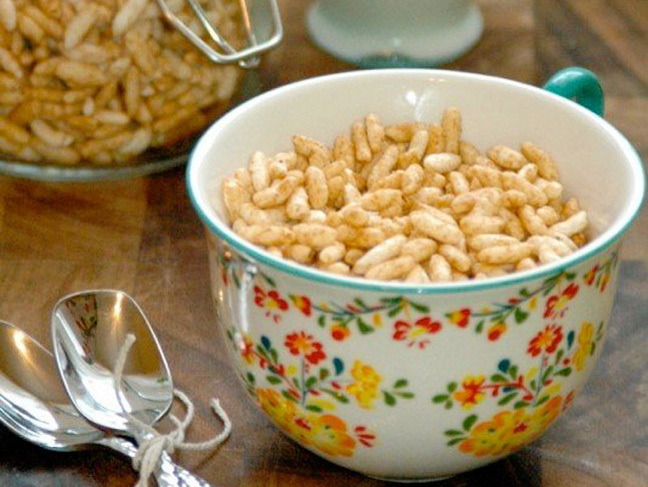 I'm skeptical of the ingredients found in commercial cereals marketed to kids, so I make my own at home. 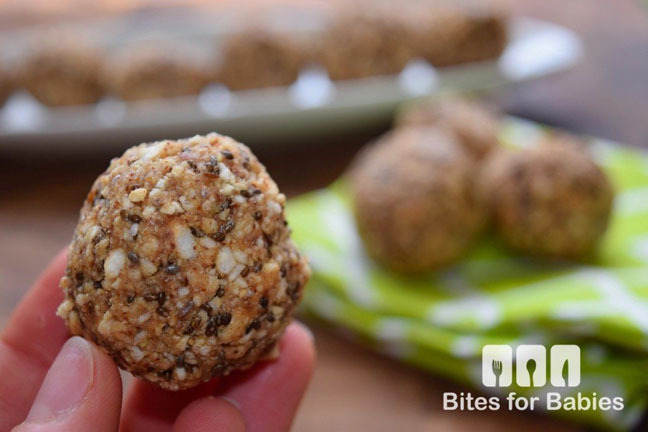 *Add-ons can include: ground flax seed or chia seeds, shredded unsweetened coconut flakes, crumbled nuts (babies twelve-plus months), dried fruit chopped finely, chocolate or carob chips, rolled oats, raisins, or cran-raisins. Step 1: In a medium frying pan, heat the coconut oil, honey, and almond butter on low heat until melted, stirring to combine until smooth. 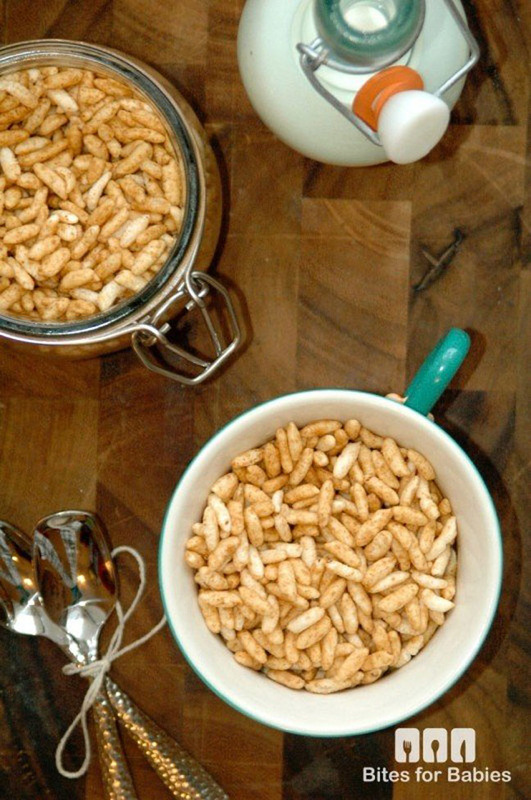 Step 2: Turn off the heat then add the puffed rice. 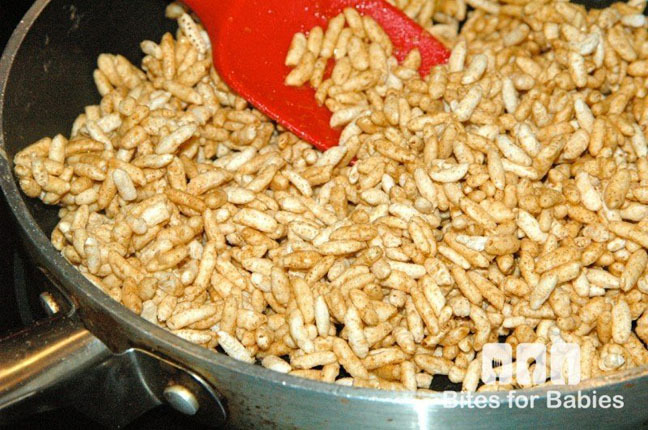 Mix with a large wooden spoon or spatula until the puffed rice is completely coated with the wet ingredients. Remove immediately from the heat and set aside to cool. Step 3: Serve warm or at room temperature as a quick grab 'n' go snack or with milk for a hearty, healthy breakfast option for baby. 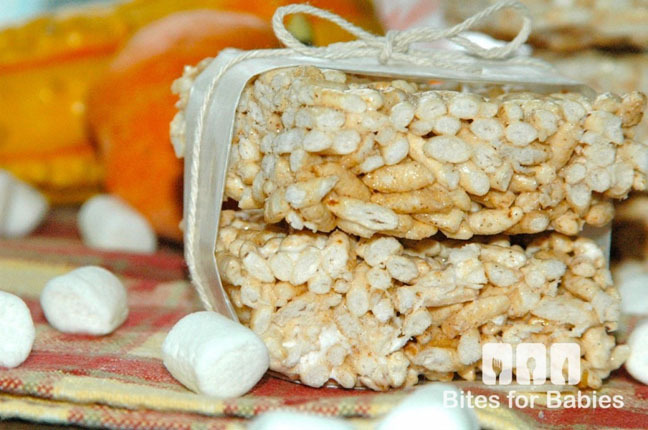 Store in an airtight container or Ziploc bag in the pantry for up to three weeks.